With autumn underway, the holidays will be upon us in the blink of an eye! 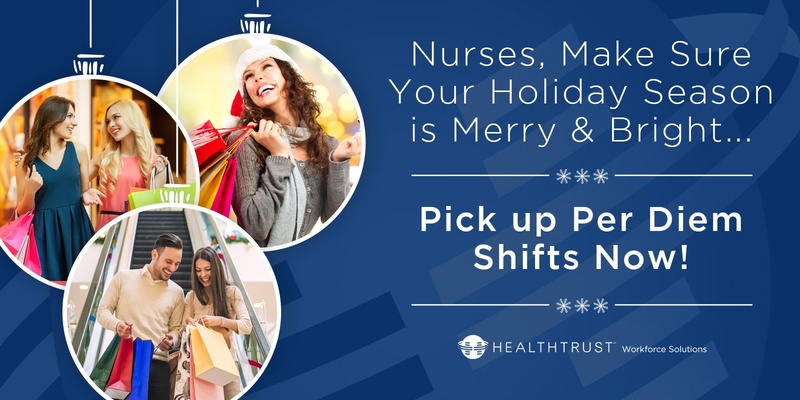 HealthTrust Workforce Solutions has holiday per diem shifts available to help you purchase the perfect gifts for the special people in your life. Parallon Workforce Solutions (PWS) was ranked as one of the Largest Healthcare Staffing Firms in the United States! This ranking was determined by Staffing Industry Analysts based on the amount of revenue generated overall and from each staffing segment in 2015. Ever wondered what it's like to be a healthcare professional with Parallon Workforce Solutions? Let our nurses tell you! What do you value most in a per diem nursing assignment? Are you a nurse looking for flexibility, expand your skill set or pick up some supplemental income in time for summer vacation? If so, be sure to check out our Top 5 Tips on Selecting a Per Diem Nurse Agency!